P - How to manually update MBAM while CA Internet Security is installed. Q - Malwarebytes Anti-Malware won't open on Windows XP but the computer is not infected. SOLUTION: Follow the directions posted here - if possible adapt to your version of Trend as needed. Further information from Trend on the subject. SOLUTION: Follow the directions posted here - if possible adapt to your version of McAfee as needed. Download and extract the contents of the zip file. Contained within are mbam-rules.exe which is for MBAM 1.x installations, and mbam2-rules.exe which is for MBAM 2.x installations. Use the file appropriate to your MBAM installation version. Double-click it to begin installation, and follow the prompts. Once it's complete, you can scan with Malwarebytes Anti-Malware. NOTE: This manual update will always be way behind in version level compared to updates from within the program. ISSUE: When I try to run Malwarebytes' Anti-Malware, or when I try to install it, nothing happens. SOLUTION: Registration is only required when you have purchased a license. If you have purchased a license, please open Malwarebytes' Anti-Malware, click on the 'Protection' tab, click on the 'Activate' button, and then enter the ID and Key that were given to you when you purchased the program. ISSUE: After purchasing, when I enter my ID and Key, I am told that my ID and Key are invalid. SOLUTION: Follow these procedures as outlined below. It will ask to restart your computer (please allow it to). Launch the program and set the Protection and activation. Then go to the UPDATE tab if not done during installation and check for updates. Restart the computer again and verify that MBAM is in the task tray. Now setup any file exclusions as may be required in your Anti-Virus/Internet-Security/Firewall applications and restart your Anti-Virus/Internet-Security applications. SOLUTION: Before reporting a false positive, you need to save a log in developer mode. This will allow us to figure out how the false positive came to be. Simply follow these directions. ISSUE: I'm not sure if I am infected or Malwarebytes' Anti-Malware keeps finding the same infection over and over, what should I do? ISSUE: I'm having other PC issues, are there any other self help articles? ISSUE: I'm getting a Runtime error 0 and 440 automation error. if exist "%programfiles(x86)%" regsvr32 "%programfiles(x86)%\Malwarebytes' Anti-Malware\mbamext.dll"if exist "%programfiles(x86)%" regsvr32 "%programfiles(x86)%\Malwarebytes' Anti-Malware\ssubtmr6.dll"if exist "%programfiles(x86)%" regsvr32 "%programfiles(x86)%\Malwarebytes' Anti-Malware\vbalsgrid6.ocx"if not exist "%programfiles(x86)%" regsvr32 "%programfiles%\Malwarebytes' Anti-Malware\mbamext.dll"if not exist "%programfiles(x86)%" regsvr32 "%programfiles%\Malwarebytes' Anti-Malware\ssubtmr6.dll"if not exist "%programfiles(x86)%" regsvr32 "%programfiles%\Malwarebytes' Anti-Malware\vbalsgrid6.ocx"
If you get an error that REGSVR32 "is not recognized as an internal or external command, operable program or batch file", then ensure that the file REGSVR32.EXE exists in the %WINDIR%\SYSTEM32 folder. If it's not found there you can copy if from another Computer running the same operating system and service pack level. If that doesn't fix it then please download and install the Microsoft Visual Basic Common Controls from here to see if it helps. ISSUE: I'm changing computers. How do I Transfer my License to the new computer? SOLUTION: Keep a copy of your ID/KEY from the computer you wish to remove it from and you can run the following to remove it from the old computer. Then install MBAM on the new computer and Activate it with the ID/KEY from the system you just removed it from. You should also have an email from Cleverbridge with your ID/KEY purchase information. SOLUTION: Most often when these two items return repeatedly it is due to the presence of an IOLO product such as System Mechanic. System Mechanic and other IOLO security products alter these settings from their Windows defaults. If you do have an IOLO product installed, it is best to simply change the security setting in your IOLO product so that it does not change the settings for .reg files and .scr files or that you simply have Malwarebytes' Anti-Malware ignore these particular detections. These entries are not actual infections, just system settings changes that are not set to their defaults, which is something that some infections will do to prevent .reg files and .scr files from executing, which is why Malwarebytes' Anti-Malware detects these items, since it has no way of knowing if the change was made by the user, an infection, or a legitimate software such as IOLO. ISSUE: Why does Windows always ask to allow Malwarebytes' Anti-Malware to run when I try to open the scanner on Windows Vista and Windows 7? SOLUTION: This is quite normal and happens because of a feature in newer Windows versions known as User Account Control. When you receive one of these prompts for Malwarebytes' Anti-Malware, simply click Continue or Allow and the program should be able to run without any issues. On Windows Vista you may also see a tray notification stating that Windows has blocked some startup programs. When you see this, click on the tray icon and if Malwarebytes' Anti-Malware is listed, click to allow it to run. ISSUE: I am receiving the message PROGRAM_ERROR_LOAD_DATABASE when I try to open Malwarebytes' Anti-Malware, what does it mean and how can I fix it? Note: If the issue occurs again after doing this, or happens frequently on your system then it could be due to issues with your internet connection, which happens most often with slower/less stable connections such as satellite and dialup. Then go to C:\Documents and Settings\All Users\Application Data\Malwarebytes\Malwarebytes' Anti-Malware and delete rules.ref. Once you've done that, start MBAM and when it shows the error and asks to update, let it do so and see if that corrects it. Then go to C:\ProgramData\Malwarebytes\Malwarebytes' Anti-Malware and delete rules.ref. Once you've done that, start MBAM and when it shows the error and asks to update, let it do so and see if that corrects it. ISSUE: I am receiving the message Run-time error '453': Can't find DLL entry point Get Config Parameter in mbamnet when I try to open Malwarebytes' Anti-Malware, what does it mean and how can I fix it? SOLUTION: Usually this occurs because you have just run a program update and have not restarted your computer yet. Please restart your computer which should correct the error. ISSUE: When attempting to mount an image using Acronis True Image with Malwarebytes' Anti-Malware PRO running, the system freezes. SOLUTION: You may either change the option while mounting a disk image to Read/write mode which is described here or simply update to the latest version of Acronis True Image (currently version 2012) available here. /errorsilent: suppresses all critical errors and writes the last error to <root-drive>\mbam-error.txt where <root-drive> is the hard drive where Windows is installed, also known as the System Drive. mbam.exe /errorsilent will suppress all errors when the program is running. /proxy <required server> <optional port> <optional username> <optional password>: allows the user to update through a proxy server. Leave blank to remove any proxy settings previously set. mbam.exe /proxy will remove the proxy settings. mbam.exe /proxy proxy.com 80 will use proxy.com on port 80 with no credentials. mbam.exe /proxy proxy.com 80 admin password will use proxy.com with the specified credentials. [*]/logtofolder <optional path>: allows the user to save all log files to the specified folder. 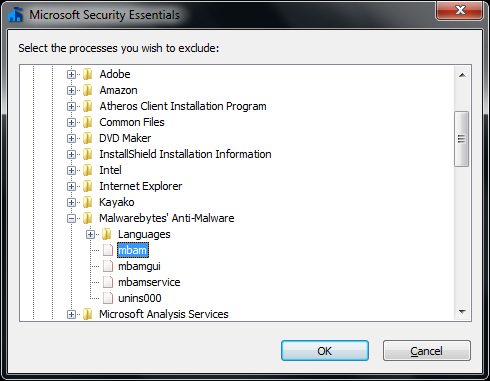 If this folder does not exist, Malwarebytes' Anti-Malware attempts to create it. If the path is blank, changes are reverted to default settings. These logs do not show up on the Logs tab. mbam.exe /logtofolder C:\mbam_log_files will save all future log files to the location C:\mbam_log_files. [*]/logtofile <optional path>: allows the user to save all log files to the specified file. If this file does not exist, Malwarebytes' Anti-Malware attempts to create it. Newest entries are appended to top of the file. If the path is blank, changes are reverted to default settings. This log does not show up on the Logs tab. mbam.exe /logtofile C:\mbam_log_files\mbam-log.txt will save all future log files to the location C:\mbam_log_files\mbam-log.txt. It is possible to see just an error 7xx or 7xx (1, 2) The 7xx error code is for the main application only and is not a Microsoft System or VB error code. to be forwarded to one of our download mirrors (such as Download.com or MajorGeeks) in order to obtain the latest version of Malwarebytes' Anti-malware. Error 700: Error occurred using the command line. Parameters may be incorrect. Error 701: The database was empty. Please reinstall the application. Error 702: Error occurred expanding variables. Contact support. Error 703: Error occurred expanding variables. Contact support. Error 704: Encryption of files has failed. Contact support. Error 705: Decryption of files has failed. Contact support. Error 706: Error loading the ignore list. Please delete ignore.dat. Error 707: Error during enumeration of languages. Please reinstall the application. Error 708: Error loading selected language. Please reinstall the application. Error 709: Error implementing language. Contact support. Error 710: Error implementing language. Contact support. Error 711: Error implementing language. Contact support. Error 712: Error implementing language. Contact support. Error 713: Error implementing language. Contact support. Error 714: Error translating item. Please reinstall the application. Error 715: Could not find the module handler. Please reinstall the application. Error 716: Could not find the database, user declined to download manually. Error 717: Database failed to download correctly. Please reinstall the application. Error 718: Could not load the MD5 hash generator. Contact support. Error 719: The operating system is not supported. Error 720: An unknown error occurred during the memory scan. Contact support. Error 721: An unknown error occurred during filesystem enumeration. Contact support. Error 722: An unknown error occurred during the memory scan. Contact support. Error 723: Could not find the SwissArmy driver. Please reinstall the application. Error 724: An error occurred loading the quarantine. Contact support. Error 725: Could not restore a quarantined file. The file may be corrupt. Error 726: Error restoring registry value from quarantine. Error 727: An unidentified item was found in the quarantine. Error 728: Unable to load the log file list. Try deleting the Logs folder. Error 729: Error retrieving special folders. Contact support. Error 730: Unable to load the database. Please reinstall the application. Error 731: Adding item to results list failed. Contact support. Error 732: Error updating the database or product. Check Internet connectivity. Error 339: Component 'comctl32.ocx' not correctly registered: file is missing or invalid. Please note that error code 732 was retired after version 1.44, and as of version 1.45 we now use a new error code system. If you are receiving error code 732 then it means that your version of Malwarebytes' Anti-Malware is out of date. Please click this link to be forwarded to one of our download mirrors (such as Download.com or MajorGeeks) in order to download and install the latest version of Malwarebytes' Anti-Malware. Some systems may have an issue where the Automatically detect settings checkbox is not checked in Internet Explorer 8 in the LAN Settings, and thus receive an error code 732. Double-click on "Internet Options" (you may have to switch the Control Panel to 'Classic' view to find it). Click on the 'Connections' tab (step 1 in the screenshot below). Click on the "LAN settings" button (step 2 in the screenshot below). Put a check mark in the box labeled "Automatically detect settings" (step 3 in the screenshot below). Try the update again (you may need to close any open Internet Explorer Windows before trying), and if it doesn't work then create a new topic asking for help. [*]Double click the MBAM icon in the task tray and do a Quick Scan to confirm there are no longer any freezing issues. Install MBAM but DO NOT enable the Registration at this time. If you're already freezing then start in Safe Mode and disable the MBAM Protection Module from loadig. Then click on the Advanced Settings button. Then click on the Program Control tab on top and click on the Add button. Click OK again twice to finish up adding the entry. This will now allow MBAM to access the Internet for updates. Click on the Exception List button. You will have to select the files one by one and add them. Please add the following files. By default the Response is set to Block so you need to click the down arrow and select Trust for all of the MBAM files. Now let's add the MBAM Driver files to the list of Trusted files. NOTE: By default Trend only allows .EXE and .COM files to be added to the list so you will need to type in *.sys or *. * and hit the Enter key on your keyboard to see the .sys file types. Now let's add the MBAM rules file to the list of Trusted files. NOTE: By default Trend only allows .EXE and .COM files to be added to the list so you will need to type in *.ref or *. * and hit the Enter key on your keyboard to see the .ref file types. If you're using the free version of MBAM you're done and Trend should no longer block MBAM. Double click the MBAM icon in the task tray and do a Quick Scan to confirm there are no longer any freezing issues. In v1.40, Malwarebytes introduced Malicious Website Blocking into Malwarebytes Anti-Malware, to prevent the user being infected in the first place. The following is information on what this does, and how it works. What does Malicious Website Blocking do? Malicious Website Blocking provides an additional layer of security for your computer, by preventing access to known malicious IP addresses and IP ranges, for example, NetDirekt, which is host to the Internet Service Team. When you ask your browser to connect to a website, Windows uses DNS or the HOSTS file (depending on configuration), to convert that domain name into it's corresponding IP address (e.g. example.com <> 1.2.3.4). Malwarebytes Anti-Malware intercepts the packet communications, to determine whether or not the IP address is known for malicious activity, and if so, blocks the communication. How does it inform you? Malwarebytes Anti-Malware informs you a malicious website has been blocked by presenting a bubble notification at the bottom of the screen (next to the system tray), and it also writes an entry to a log file. I have it set to show the notifications in Malwarebytes Anti-Malware but they do not show up, how can I fix it? Save the file to your desktop and double click it to run it. Reboot your PC when done and then visit iptest.malwarebytes.org, our own safe Malicious Website Blocking test page to verify that it is blocked and that you are now receiving the tray tooltip notifications. What does this notification mean? This notification means quite simply, that a malicious website has been blocked. It does NOT necessarily mean you are infected, it simply means a program on your computer (e.g. your browser, IM program, P2P program etc), tried accessing a malicious website contained in our database. If this notice was presented when you were not actually doing anything on the machine, then we suggest having your computer checked for infection, as this could be a sign of some malware, such as a rootkit or Trojan. I got an alert and I wasn't even surfing, how's does that happen? There are many applications on your system which have access to the Net and any of these can trigger an alert with no browser open. Most common offenders are P2P applications and IM clients, usually an ad will trigger an alert. An advanced or premium firewall will be able to give you a list of programs which can access the Net. I received a notification on a safe site, why? If a notification is displayed when visiting a safe site, and the site loads, it is likely the site was loading content that is hosted on a server known for malicious activity. In this case, the site itself will be displayed perfectly fine, with the malicious content being blocked. If however, the site does not load, it is likely the site is also hosted on the same malicious IP address. It is also entirely possible that the site in question, shares it's IP address with other malicious domains. IP's and IP ranges are blocked if they are either dedicated to malicious content, or have a higher proportion of malicious content, than non-malicious. So for example, if 1.2.3.4 contains 1000 sites and over 50% are malicious, then 1.2.3.4 will be blocked (and even then, if we can get the hosting company to take down the malicious sites, then even better as we do not like blocking shared IP's or IP ranges if we don't have to). We wouldn't recommend disabling it, but if you must, you can do this by right clicking the Malwarebytes Anti-Malware tray icon, and unchecking Website Blocking. You can also use the two options in the Protection tab of Malwarebytes Anti-Malware to disable Malicious Website Blocking from starting when the protection module starts or simply to disable the tooltip balloon notifications when a malicious site is blocked. I got an alert for an IP or website I think is safe, how can I report it? If you find a site being blocked, and either don't know why, or are sure it's safe, please report it to us at the False Positive Forum. IMPORTANT: When posting false postive reports, please ensure you post both the IP address affected, and if applicable, the domain name (e.g. example.com). Does Malicious Website Blocking replace my firewall? Absolutely NOT! The Malicious Website Blocking included in Malwarebytes Anti-Malware is NOT a replacement for your firewall. Where do I find the Malicious Website Blocking logs? How can I add an IP so it won't be detected and can access a site I need to? Visit the site and incur an IP block. Then right-click on the Malwarebytes system-tray icon after the block notification appears, and use the Add to Ignore List menu, selecting the IP address in question for the website you wish to exclude from being blocked. 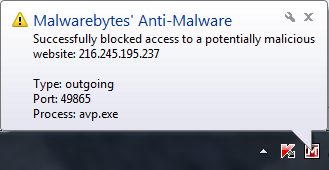 Why is Malwarebytes Anti-Malware blocking my antivirus? Click on the + next to Program Files Note: This should be Program Files (x86) for 64 bit Windows versions. Click on the Add File button on the right and scroll to the right until you find mbamswissarmy.sys and double-click on it Note: This will be C:\Windows\SysWOW64\drivers for 64 bit Windows versions. We've noticed that Microsoft Security Essentials and Malwarebytes' Anti-Malware both running real-time protection at the same time have a tendency to cause your computer to freeze. Below is detailed a quick solution to any potential freezing issues (performing these steps is a must for Windows XP users). If you are already experiencing the freezing issue: Restart your computer in Safe Mode (instructions at this link), uninstall Malwarebytes' Anti-Malware and restart your computer normally. Once you've started back into normal mode, reinstall Malwarebytes' Anti-Malware, but do not enable the protection module yet. For users experiencing issues with Norton 360 version 4 and Malwarebytes' Anti-Malware (such as freezing, general loss of performance, etc), please follow the directions below to add exclusions to Norton 360 in order to aid in compatibility. Make sure to click 'OK' when done. If you continue to experience problems after adding those exclusions and closing Norton 360, please contact our technical support. When the machine first starts again it will generally list some equipment that is installed in your machine, amount of memory, hard drives installed etc. At this point you should gently tap the F8 key repeatedly until you are presented with the Windows XP Advanced Options menu. You should then be presented with the Windows XP Login screen. Log in to Windows and when it prompts you about Safe Mode and asks if you'd like to continue click Yes. When the machine first starts again it will generally list some equipment that is installed in your machine, amount of memory, hard drives installed etc. At this point you should gently tap the F8 key repeatedly until you are presented with the Windows Advanced Boot Options menu. You should then be presented with the Windows Login screen. Log in to Windows. Once in Safe Mode, try running a scan with Malwarebytes' Anti-Malware to see if it is now able to complete without freezing or crashing. If the scan does not freeze or crash, the issue may be either related to a piece of software on your system, such as a security program or a driver that does not load in Safe Mode but does in normal mode causing the freeze or crash or it could be the DDA driver used during scans in normal mode by Malwarebytes' Anti-Malware having issues with a corrupt file or sector on your hard drive. Since Malwarebytes' Anti-Malware's DDA driver does not load in Safe Mode, this helps narrow down the issue. 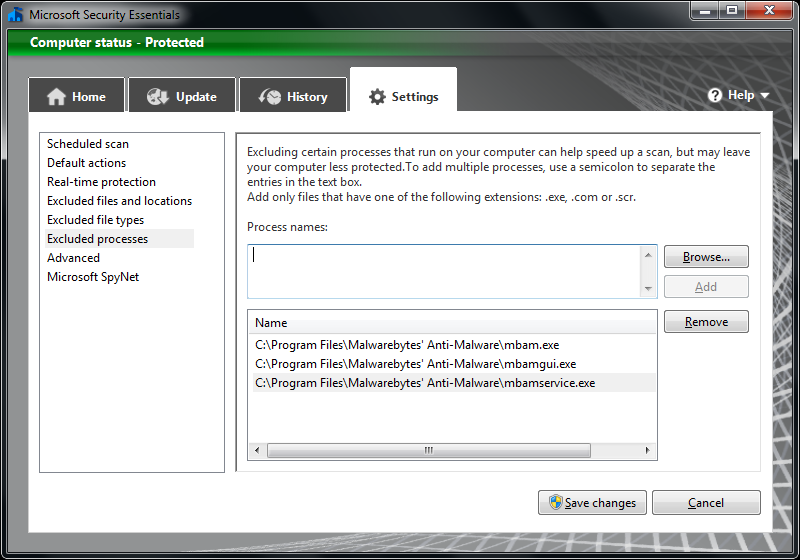 Once that is complete, attempt another scan with Malwarebytes' Anti-Malware to see if the issue is now resolved or not. Note: You may need to run CHKDSK more than once in some cases to repair a problem, so if issues are found during the chkdsk scan and the scan with Malwarebytes after that still has the issue, try the above procedure again to see if there are any additional errors that get fixed then try scanning with Malwarebytes again. HKEY_LOCAL_MACHINE\SYSTEM\CurrentControlSet\Services\Tcpip\Parameters\DhcpNameServer (Trojan.DNSChanger) -> Bad: (213.109.65.147) Good: () -> Quarantined and deleted successfully. Let's try to reset the router to its factory/default configuration. You will need the user manual for your router. NOTE: You may want to ask your ISP for help ahead of time, in case there are custom settings that need to be maintained. To reset the router, insert something tiny like a paper clip end or the tip of a pen into a small hole labeled "reset" located on the back of the router. With the power to the router on, press and hold down the small button inside until the lights on the front of the router blink off and then on again (usually about 10-20 seconds). After resetting the router, login into the router by following instructions in the user manual. You will need to reconfigure any security settings you had in place prior to the reset. You can follow the directions below and someone will assist you with running scans on your system to see if they can detect anything. Please print out, read and follow the Directions HERE, skipping any steps you are unable to complete. Then post a NEW topic here. One of the expert helpers there will give you one-on-one assistance when one becomes available. After posting your new post make sure under options that you select Track this topic and choose one of the Email options so that you're alerted when someone has replied to your post. Version 1.51 introduces a new version of the scheduler. This guide is intended to navigate to the scheduler as well as the basic ways to add/edit/delete the items saved within the scheduler. How to manually update MBAM while CA Internet Security is installed. During Manual update of MBAM you receive the prompt: 'You have the latest database version.' Even though you do not and are using CA Internet Security. Currently CA Internet Security blocks MBAM's manual update request to the update server. MBAM is within CA's Trusted group for monitor and control access for programs. Within CA Internet Security go to My computer -> Update Settings. Click the (+) sign next to Trusted. Scroll through the list within Trusted, locate and click mbam.exe. Uncheck Enable Privacy Protection then click Save. MBAM should manually update correctly. Note: This issue only occurs on Windows XP, if you are running Windows Vista or Windows 7 and Malwarebytes Anti-Malware won't open, then the presence of an unseen infection is the most likely cause because those Windows versions do not allow the Windows installation drive letter to be any other than C:. Instructions below are based on this Microsoft Knowledge Base article. Click on Performance and Maintenance Note: If you do not see Performance and Maintenance listed, click on Switch to Category View on the left pane of the window. Resetting the Malwarebytes Anti-Malware schedules from the command line. There is a 15 minute randomized delay in the scheduler for MBAM updates so + or - 15 minutes is normal for updates with the scheduler. Scans will run at the time set for though. From an elevated admin command prompt please do the following. Please type the following and press the Enter key at the end of the line. Please type the following and press the Enter key at the end of each line. There will not be any feedback normally unless you type it wrong. If completed correctly it should look very similar to the image below.